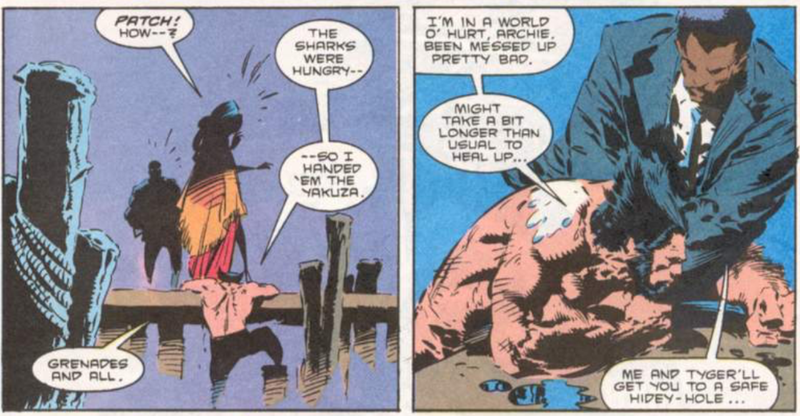 Back at the Princess Bar, the fight between the Yakuza and Wolverine brings down part of the building and spills out onto the streets, while Archie learns the police have been bribed to stay out of the fight. At the Prince's palace, Tiger asserts that the notion of taking out Wolverine would be rash, and, worried about Dai-Kumo's true intentions, declines his offer, just as Goro brings Dai-Kumo news of Wolverine's death. In Lowtown, three of the Yakuza take Thunderbolt, the actual drug Dai-Kumo is planning to manufacture, which grants them superhuman abilities, then savagely attack an over-taxed Wolverine. 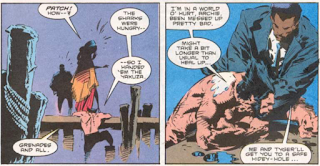 Tiger and Archie arrive on the scene just as the last remaining Yakuza tackles Wolverine into the harbor while holding live grenades, but after a large explosion, he climbs out of the water, having fed the Yakuza to sharks. Watching from afar, Goro vows to Reiko that he will take care of Wolverine himself. This issue marks the beginning of both Larry Hama and Marc Silvestri's run on the series. Silvestri, who left X-Men specifically to draw this series, will stick around, barring a few fill-ins, until issue #57, while Hama, a long-time Marvel editor and freelance writer best known for his long run on the original GI Joe series (as well as writing most of the Joe file cards for the original Real American Hero action figure line), will last, three fill-in issues aside, until issue #118, making him without a doubt the dominant creative voice of this series (at least in its first volume), and arguably the most significant writer of the character after Chris Claremont. Silvestri is joined by his Uncanny X-Men inker Dan Green. Dai-Kumo, the leader of the Yakuza in this issue who appears for the first time, will later be revealed to be working for the Hand in this story. 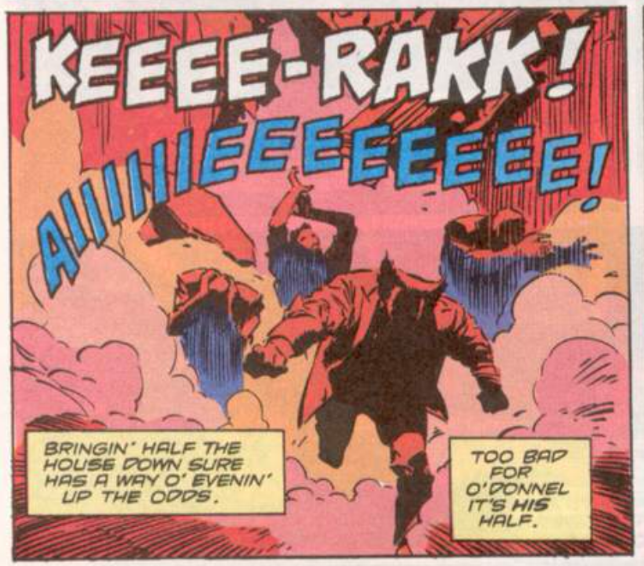 A reminder that Wolverine owns half the Princess Bar, he jokes when his fight with the Yakuza bring part of it crashing down that it was O'Donnell's half which got destroyed. 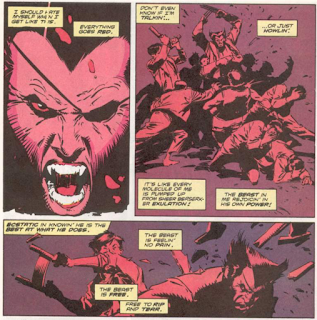 Wolverine also references the time he fought and was stabbed by Shingen Yashida, in the original Wolverine limited series. During the midst of his battle with the Yakuza, Wolverine briefly slips into a berserker rage. After the fight, he notes that given all the damage he's taken, it will take his body longer than usual to heal. "Larry is just one of those guys who's intimidating without you ever even having to meet him. He's got this great voice, one that is just full of bravado. He could order lunch and you can almost hear the guy taking that order trembling over the phone. Larry was great! Larry's probably the most manly man in comics, I'd say... But I loved Larry's stories: he wrote like he was. He presented Wolverine as the manliest man in comics, bar none. There was a reason why he was covered in hair! You've got to read those stories. I had a great time with Larry. I think I did much better work on his Wolverine stories than I did on Chris's X-Men stories. And I'm only kidding about Larry. He's actually one of the sweetest guys in I know (I have to say that or he'll kill me)." The arrival of Larry Hama as writer and Silvestri & Green as the new art team in this issue essentially serves as a second beginning for the series, giving it a consistent artistic voice and vision for the first time since the earliest days of the title (and, given that the Claremont/Buscema pairing that launched the book lasted for less than a dozen issues, it could be argued this marks the beginning of the book's first significant creative run) and, with that in mind, it's hard not to be excited while reading it. 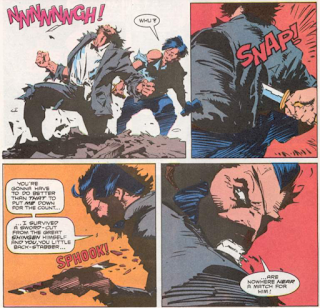 But without the benefit of hindsight, there's honestly not a lot to this issue to make it all that different from the various stories and creative runs that preceded it: Silvestri & Green are fine, transitioning smoothly from Uncanny X-Men, but the plot here isn't terribly complex; it's essentially an issue-long fight between Wolverine and some mostly generic Yakuza goons. But that said, there's some flashes which suggest better things ahead even without the benefit of hindsight. 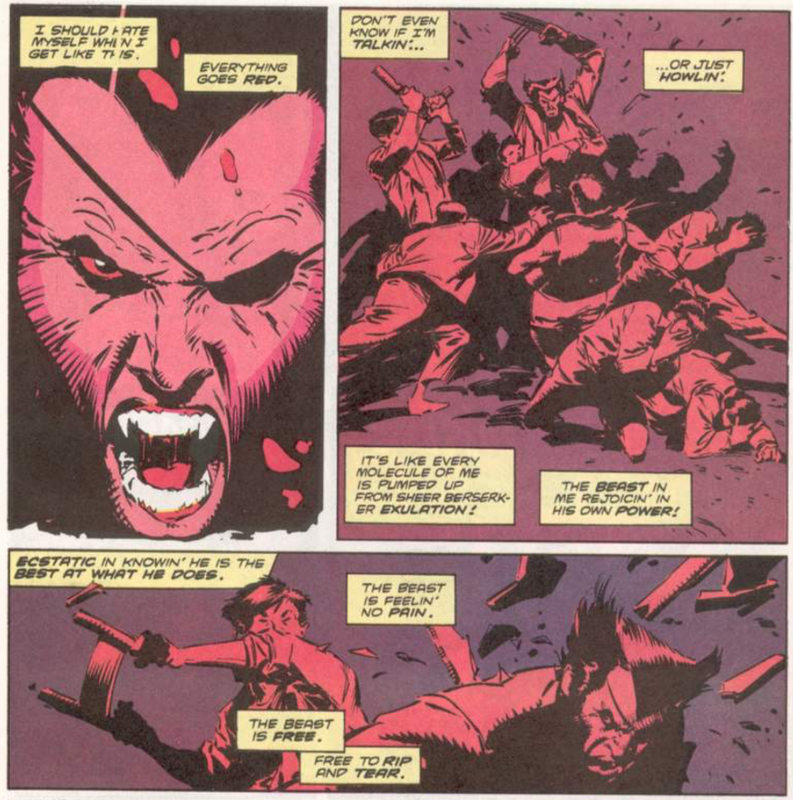 Hama makes use of what's left of the book's supporting cast, including the Prince, Tyger Tiger, General Coy and the under-used Archie Corrigan, and plants the seeds for a larger narrative arc, both in the specific details involving Dai-Kumo's drug scheme and in the use of the Yakuza, begininng the strengthening of ties between Wolverine and Japanese culture that will become a hallmark of Hama's run. More importantly, right out of the gate, Hama displays a strong understanding of the title character. Wolverine doesn't do much besides fight in this issue, but his internal monologue, delivered via narrative captions, fits the gruff, weathered voice established by Claremont in the original limited series and the early issues of this one. The struggle to control his wilder urges, his devotion to his friends, the resiliency of spirit as well as flesh; these are all, at this point, basic elements of Wolverine's character, but it's important to have a solid grasp of the basics, and Hama shows that here. In the moment, it's not that exciting of a beginning, for either a story or a creative run. But knowing what's to come, it's nonetheless refreshing just to know the series has finally reached the start of a consistent artistic vision. For now, that's enough to make it exciting. Next week, X-Factor: Prisoner of Love. That comment from Silvestri about Hama is great, and is pretty much in line with everything else I've ever read about the guy. Hama seems to be universally loved within the comics world, at least by people who knew and worked with him in the eighties. And while I love his G.I. JOE (easily one of my all-time favorite extended comic book runs) and what bits of his WOLVERINE I've read (I didn't get on board until some time later, after "Fatal Attractions"), I can't understand why he's not more respected for his writing, and why, according to Hama himself, he seemed to have such a hard time finding work outside of G.I. JOE (I think I recall he took WOLVERINE because nobody else wanted it at the time). I think I re-read this issue 100 times just in the month it came out. Besides everything else, it was my first exposure to Brousseau's lettering. I believe he eventually went on to be the primary letterer of Mignola's Hellboy. The Hama/ Silvestri/Green/et al run is the best the series would ever have. Hama ably mixed down n ' dirty action with humor and occasional pathos while the art team had just enough flash without sacrificing the grit. This was a comic that felt like hard boiled men's fiction to my adolescent self. Later issues had their ups & downs (even with good artists like Mark Texiera and Adam Kubert) but the Silvestri years were awesome. I think Larry Hama's reputation suffered after a poor run on Generation X and a disastrous run on Batman. His Batman issues were universally mocked and panned. Creating one of the worst Bat-villain, Orca the Whale-Woman, didn't help. I wish he could have gotten another chance but I doubt the big-2 want anything to do with him. It's a shame because he could probably do some great work on a book like Green Arrow or Heroes for Hire. Jason- I'm pretty sure Chris Sims ignores most opinions that do not come from Chris Sims. I feel dirty for liking Hama's WOLVERINE, it's kind of like I was cheating on Claremont. 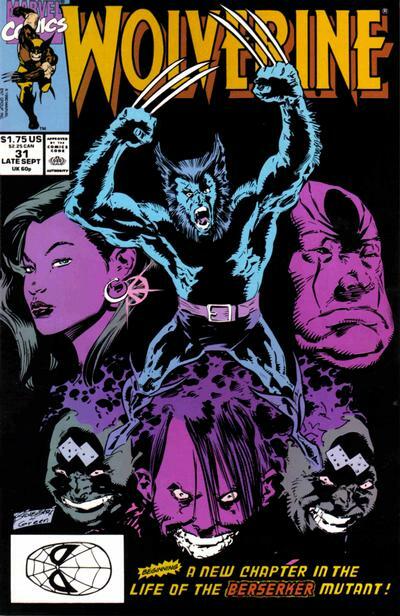 And of course, Wolverine + 90's is a word combo you instinctively freak out a little, even if you were there and feel that Wolverine went full 90's only in mid-decade or so and most of Hama's run was more like honorary 80's. 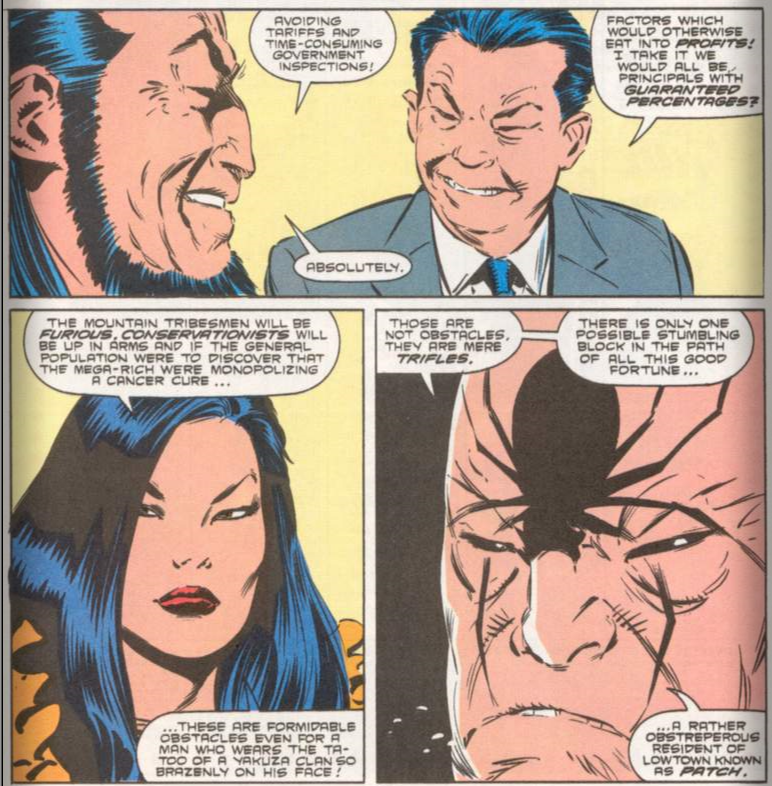 If I may propose a thing for the blog for WOLVERINE issues, there could be a "Pluggin' the memory implants of the ol' Canucklehead" section for the instances where Hama downright contradicts what Claremont had previously told of Logan's history. Because that's where the actual harm was done to the character as I knew him. Hama and Claremont were pretty good pals, from what I understand. 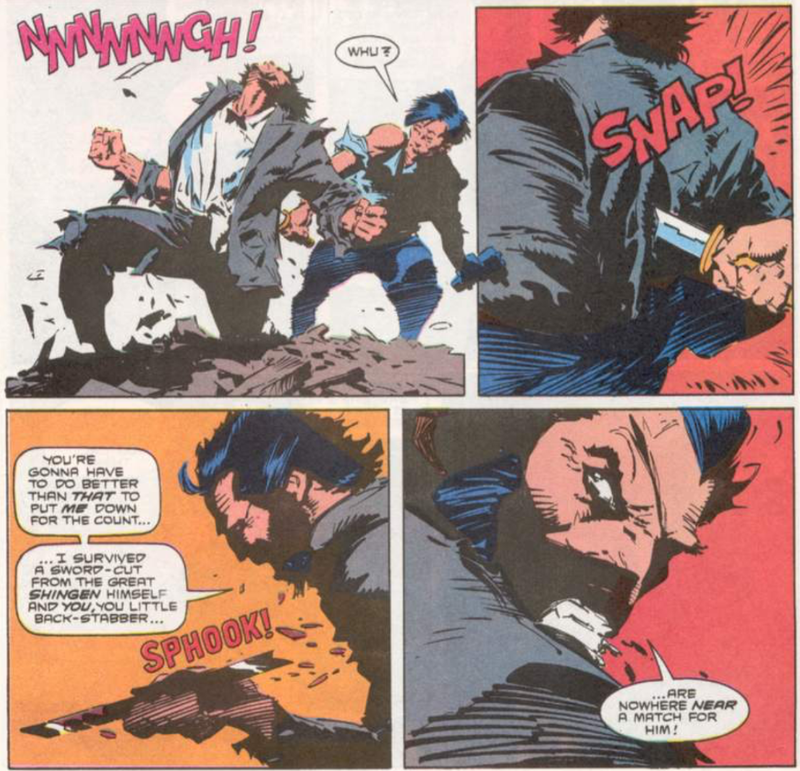 And Hama referenced a lot of Claremont's Wolverine stuff: The Hand, the Silver Samurai/Black Blade, Mariko's pledge to cut her criminal ties, the Wolverine/Deathstrike rivalry, Gateway, Cylla Markham ... and in these early issues, all the Madripoor stuff of course. LLL had a knack for time travel, among other things, at least when Zoe Culloden pops up eventually on WOLVERINE. So if the futuristic implication wasn't done on purpose here, then Larry Hama has just firmly secured the throne of the maintainer and builder-on of Claremont's legacy as far as I'm concerned. Ha, the man will taking more cues from Claremont's UNCANNY and specifically this arc than from other writers' WOLVERINE of the same era. So the point you make is not only the correct one but one that I personally cherish and hold in high regard. I actually was contemplating on mentioning in my comment the fact that the Weapon X program segments of Hama's Wolverine collide with the instantaneously post-Claremont X-MEN #4-5 with Maverick and Creed popping up as the past associates of Logan. I should've perhaps worded it so that "in Hama's issues is contradicted". It should of course not me held against Hama that he ties a solo book to what's happening on the main title. So the intention was not to put Hama down but just to wail&rail at the backstory changes. The guilt for liking Hama springs mostly from the fact that I have no particular love whatsoever for Lobdell and Nicieza, Claremont's successors on the main titles. It's actually pretty insane, now that I actually think about it. Mike -- "I think Larry Hama's reputation suffered after a poor run on Generation X and a disastrous run on Batman." I never read Hama's BATMAN, but I think I may have been the only one who liked his GEN X. But that may have been more due to Terry Dodson on art, though I think he came along near the end of Hama's time on the book. But heck, I didn't even mind that "Pooka" thing. The key is to imagine its dialogue in the voice of Bill Murray. I really want to read Nth Man. I’m already liking this grittier art, with its definite Buscema influence, more than Silvestri & Green on Uncanny. While I’ve never read what’s to come in Hama’s run — at least not ’til a stretch of issues a few years down the road, around Fatal Attractions, flipped through at the comics shop where I worked — if the series continues along in this fashion I’d certainly deem it better than what little of the other ’90s X-Family stuff I recall from the period. I gather the era of the series with this general feel only lasts until about a year down the line, though, publishing time, when the new Adjectiveless X-Men launches. "I gather the era of the series with this general feel only lasts until about a year down the line, though, publishing time, when the new Adjectiveless X-Men launches." **Yeah, almost exactly. To me, issue 43 is the last of the unbroken run of Hama/Silvestri greatness that begins with this issue. After that, things get a little spotty with the whole "origin"/"Weapon X"/memory-implant stuff interfering. I'm a big fan of the "everything but the kitchen sink" trilogy in Silvestri's last three issues (55-57), but there's no denying that by that point the series is much more "90s-X-book"-y, more bright and glossy and primary-colored, than it was in the first year. "I’m already liking this grittier art, with its definite Buscema influence, more than Silvestri & Green on Uncanny"
***I prefer them on Claremont's stuff overall (probably not surprising), but for what it's worth, Claremont agrees with you. He's got a quote in the "Comics Creators on X-Men" book about how when he saw Silvestri's work on the Wolverine solo title, he felt envious, i.e., "Why couldn't I get that out of him?" @Matt: I can't understand why he's not more respected for his writing, and why, according to Hama himself, he seemed to have such a hard time finding work outside of G.I. JOE (I think I recall he took WOLVERINE because nobody else wanted it at the time). Ditto. I'm also surprised to hear nobody wanted Wolverine. It's not like editorial was forcing it to march in step with X-Men, and you'd think the opportunity for royalties and whatnot on such a popular character would be enticing. @Jason: This Wolverine run in particular is pretty undervalued, I guess because it is a 90s X-book. Chris Sims, who never passes up a chance to praise Hama's GI Joe, once wrote off his Wolverine in an aside. Yeah, like Mike said, Sims can be pretty insufferable when it comes to acknowledging that maybe someone could have a valid opinion on something that differs from his. You're right that this run in general seems undervalued. I think, in general, people tend to remember/think of it in terms of the whackier, 90sish stuff towards the end (like Genesys and Noseless Wolverine) while forgetting the more solid stuff from the beginning. Heck, even the post-adamantium-losing stuff, from #75 up to when "Age of Apocalypse" starts is pretty solid, but it all gets overshadowed by the dubious Onslaught-era developments. @Mike: I wish he could have gotten another chance but I doubt the big-2 want anything to do with him. It's a shame because he could probably do some great work on a book like Green Arrow or Heroes for Hire. Ditto. I'd also like to see his take on a SHIELD book (which is what GI Joe was going to be in the first place), or just something totally random, like, oh, Daredevil. @Teemu: If I may propose a thing for the blog for WOLVERINE issues, there could be a "Pluggin' the memory implants of the ol' Canucklehead" section for the instances where Hama downright contradicts what Claremont had previously told of Logan's history. Because that's where the actual harm was done to the character as I knew him. We'll see if my recollection is off as we go along (since I've never actually read the Hama-implant issues, just the contemporaneous X-Men stuff), but I feel like most of Hama's retcons-via-implants didn't so much contradict Claremont's history as add to it/embelish it/present it in a new light. For example, he didn't wipe out the whole "Sabretooth hunts Wolverine on his birthday and killed Silver Fox" thing from Wolverine #10, he just revealed that Silver Fox survived and the whole thing was staged - which isn't quite the same as saying "nope, never happened". Like I said, we'll see. I could be wrong. But we'll keep track of that stuff, one way or the other. Mostly I was thinking about the total (felt) discrepancy between Claremont's Ogun/Carol Danvers spy background versus Hama-era Weapon X filmset memory implant factory and Wolvie's perceived amnesia.